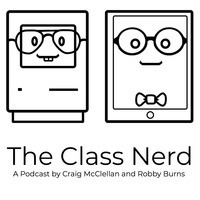 This week, Robby and I published episode 3 of The Class Nerd Podcast. While I’m really pleased with the quality of what we have produced so far, I’m definitely still very new to talking regularly on a microphone. I’m still learning what I need to have written down in an outline, how to manage time (we were originally aiming for a 60 minute show and settled on half of that), and more. As I’ve listened back to episode 3, I feel like I didn’t do my beloved Bear justice. Some of this is due to Bear having features Robby mentioned in his Evernote section and I didn’t want to rehash, but I should have at least acknowledged them. Some of it is just me getting excited while talking and forgetting. Today I wanted to share a little more about what has really drawn me to Bear, even though it does have a few shortcomings. We have mentioned markdown a few times over the course of the podcast, and in next week’s episode we’ll actually be diving deeper. But since it’s one of the most important features of Bear for me, I wanted to explain just a bit more about it. Markdown is a language for writing that allows you to include formatting in plain text. You can create links, lists (both bulleted and numbered), bold, italics, and more just by surrounding your text by a few characters. This is by far the most convenient way for me to write on a computer. 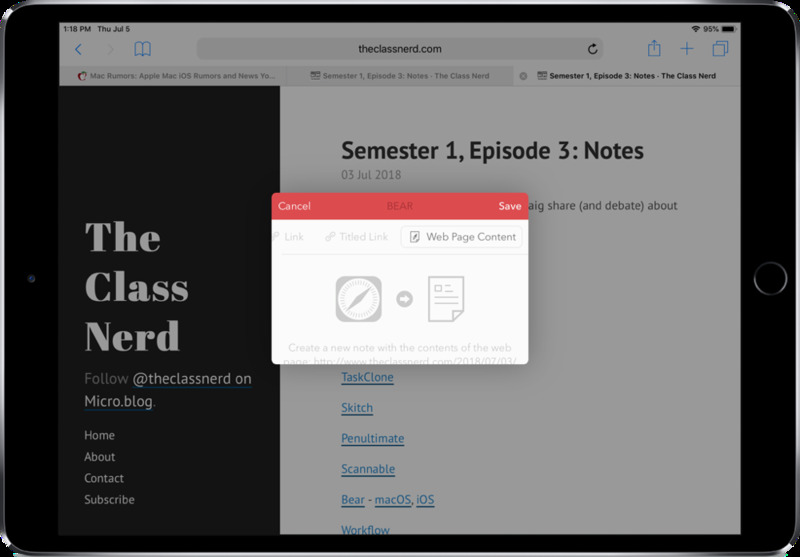 I use it for writing texts for my students to read in the classroom, for writing on this blog, for emails, and more. If you have an app that works with markdown, it will likely preview the formatting live in the app and allow you to export the writing in a way that hides the extra characters, but leaves the formatting. Here is a note being written in Bear with the jpg export next to it. You can see that the jpg doesn’t have any of the extra characters around it. Having a note taking app that works with Markdown is incredibly useful. Often I want my notes to have a hierarchy, and being able to just type as many # as I need for different levels of heading saves me so much time. My notes also frequently have URLs and lists. Quick markdown input saves me time on these as well. In our notes episode, Robby talked about Evernote’s ability to clip the content of webpages and save them as notes. I used to do this constantly back when I used Evernote. I mostly saved interesting articles I thought I would want to read again. The thing is, I almost never read them again and they began to clutter up my searches making it more difficult for me to find information I actually needed. Still, this can occasionally be a handy tool, and Bear offers it as well through its share extension. If I view a website in Safari on my iPad and want to save its contents, I can tap the share button, then Bear’s icon in the share sheet. This will let me save a link to the website, a link with a title, or the full text of the website. In my testing, while Bear doesn’t get the text extraction right 100% of the time, it is still very useful and at least as reliable as Evernote. I mentioned Bear’s ability to work with apps like Drafts passively in the episode (next week’s episode is all about Drafts, so get excited). However, I wanted to share in more detail how I’m using these features. Drafts is by far the fastest and easiest way to get text into an iOS device. Either through Siri, the Apple Watch complication, or just opening the app up and starting to type, most things I type on my devices go through Drafts. Currently in Bear, I have a note with a list going of things I need to discuss next time I meet with my new 3rd grade team. When I think of another item to add to the list, instead of opening Bear, searching for the list, entering typing mode, then typing, I have created a simple action in Drafts to help me out. When an idea comes to me, I’ll write it down (or dictate it) in Drafts. At that point, I may just leave it be until I have time to process it later. Whether I decide to process immediately or later, all I have to do is tap one button in Drafts, and it magically adds a bullet and appends it to that particular note in Bear. You can create even more powerful automations with Drafts (or Workflow) and Bear, but I’ll save some of that for next week’s episode. After moving from Apple Notes to Bear, the biggest thing I miss is handwriting support. Yes, Bear does allow you to hand write in notes, but it is far more limited than Apple’s app. The way I’m currently getting around this is by either handwriting the notes in GoodNotes, or sketchnoting in Linea Sketch, then exporting to Bear. Is this a complete hack? Absolutely. Should Bear make handwriting more of a priority? Yes. But do all of the other benefits of Bear make it worthwhile for me to use this hack? 100%. If you want to use Linea for drawing, I use this workflow to convert the jpg to a PDF for storage in Bear. No app is perfect, but Bear works so well what I need it to do that I’m willing to overlook shortcomings. It genuinely brings me joy to use, and makes me more productive in my classroom and at home. If you’re looking for a note taking app, I highly recommend it. 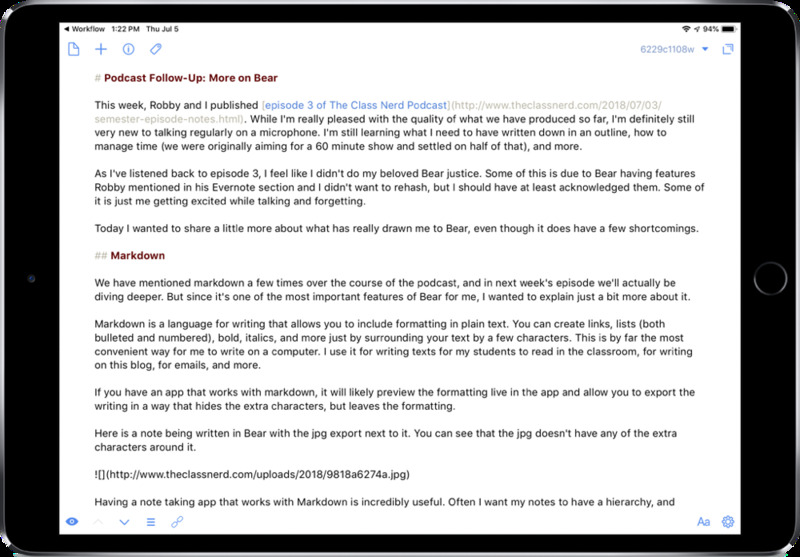 Bear is available for free on the iOS and Mac, and has a subscription to unlock pro features.